The harvest tool will recurrently poll the MediaWiki address looking for new online medatada since the last successful query. Actually, this tool uses the main configuration application file as input file. Current application's instance will get the harvested source parameter and will query against the API exposed by K2N Harvest Tool. new collections metadata, but if Modified it's the same like the last successfully ingestion for a certain collection, then application skips this collection and sought for the next available collection. All new metadata collections will be stored in a work database, as jobs to do. See also Implementation_details_of_Java-based_Fedora_Ingestion_code#Task_management. This parsing tool downloads new metadata and performs a simple syntactical analysis in order to discover lacks in metadata. In this stage, a simple transformation of metadata would be necessary. 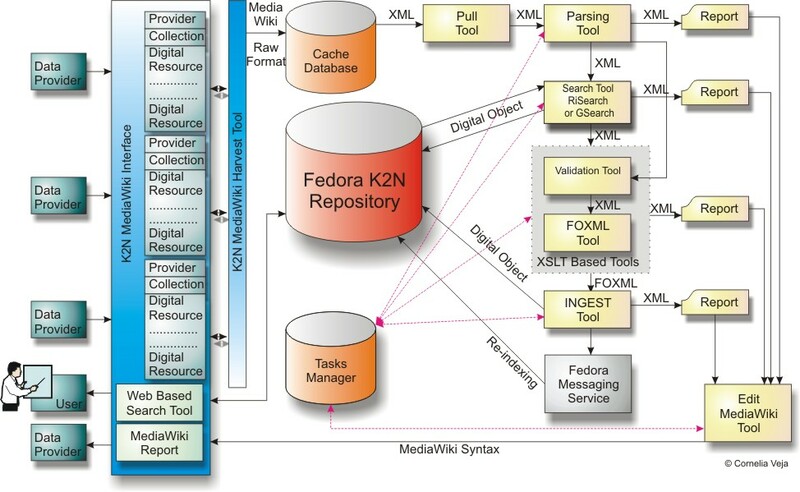 A good example is translation between Infobox Organization wiki template element names, used for providers, and K2N metadata in respect with Resource Metadata Exchange Agreement. MediaWiki page (PageName). This algorithm is meant to ensure the PID persistence over time and oneness as well. by  provider, MD5-hash will applied to ResourceID+BaseURL+Collection_Page. Best_Quality_URI will be used instead. A Search Tool is looking for already ingested objects. This tool is based on SOAP clients (Fedora API-A, API-M and GSearch SOAP Client). 1. GSearch was pick up to accomplish this operation, as a first option. Nevertheless, GSearch is a little lazy in searching against relation external, and too verbose in results. And, if , by mistake, the repository are not indexed, GSearch never find the collection and collection's members. This is slightly unpleasant, because currently in repository exists old version of these collections, as results of the second survey metadata aggregation process. 2. SPARQL, the query language on the semantic web, as the second option. The results are expressed in SPARQL too. During the tests, the second method was proved to be more reliable and rapid that the first one and the result is less verbose then in the GSearch usage. But we still keep both methods, and the effective usage of one or other method could be configured by setting a parameter in the main application configuration file. Observation. ASK query return "false" all the time. This was reported as bug in Fedora Commons Developers Community. This page describe the Validation and FOXML generator tool, destinated to preparse FOXML files for ingest and establish the relationships between digital objects. Validate files - takes each small file and validates it and produces an xml file containing the validation report. In this stage, it could be used a Vocabulary, defined for all metadata that could have a controlled vocabulary. This vocabulary will be defined separatelly, for each metadata which can require limited and exact values. For each metadata element, a separate xml file named: metadata_name.vocabulary.xml should be used. Create error/warning files – takes the validation report file and creates two xml files: errors.xml and warnings.xml + an xml file valid_files.xml containing the list of valid files that can be processed further (didn’t contain any errors). Generate FOXML files – generates the foxml files from the xml files. At the end of this process, all the intermediate xml files will be deleted, and Java Garbage collector is explicit called in order to clean up the memory. On the work directory will remain the FOXML files prepared for ingest and xml report files. As a technical solution, this tool uses Xalan-java 2.7.1 XSLT processor. This tool could be called as standalone too, using as input parameters: the path to the temporary work directory with xml files and the path to Vocabulary directory, if needs. The main operation is done by Effective Ingest tool. The FOXML files prepared for ingestion in the previous steps, are ingested effective. During this operation, Task Manager will monitoring all the activity. Function of the collection's members count, Task manager calculates a proximate ingest time. More, for a large collection, it creates restart points for the ingest operation. So, the ingest will be done by batches formed by 1000 digital objects. The output of this operation is a result xml report containing a statistics for ingest: how many objects were ingested successfully, how many objects were overwritten and the time during this operation. As a optional implementation feature, at the end of ingest, the working directory might be deleted. During the tests, this option was disabled. This service could be called as standalone service, with input parameters: the path for working directory in which FOXML files are stored and the restart point from which the ingest would be restarted. Technically, Effective Ingest tool is a SOAP API-M client for Fedora Commons API. The SOAP API-A is used also in order to seek first if the digital object is already in repository. If an old version of this object is found, this object is first deleted, and after that a request for ingest is fired. This step represent a second check for an old object existence. The purpose is: if a previous ingest operation unsuccessfully completed, and the relationship with collection and providers have been broken, though current ingest has an other change to complete successfully. This step is strongly tied to Task Manager. See bellow the Task Management section at Implementation_details_of_Java-based_Fedora_Ingestion_code#Task_management. MediaWiki editing tool is created to write messages for metadata providers. The outcome consists of MediaWiki pages, linked to existing collection pages. During the entire work flow, messages as warnings, errors, statistics results of ingest are collected in xml files. MediaWiki Report tool gathers this messages and create automatic a mediawiki page. This page will be tied to the template collection page from which the metadata are originally collected. This is considered the 5th step in the entire work flow. From technically point of view, this tool use Bliki engine, as a Java extension API for MediaWiki, under Eclipse Public License - v 1.0. See also Bliki engine. MediaWiki editing tool can be called as standalone application, having as input parameters the main properties configuration file and the original path for the collection working directory. The search tool, based on the GSearch engine, is able to retrieve new digital objects after every new ingest. No more then 3 tasks will be active in the same time. Presuming that one task perform thumbs generation, only 2 tasks will perform ingestion in the same time. Other collection for ingestion, ask the TemplateParameterIndexer for more collection for ingest. the task scheduled fire the application. See Implementation_details_of_Java-based_Fedora_Ingestion_code#Implementation_restrictions above. application reads from work database looking for a waiting job to do. If exists thumbnail generation job? else If exists collection for ingestion? else Download other Collection from Mediawiki if exists. job is activated using codes for every operation. For every operation, in database is written the date for operation's end. More, for ingestion job, in database are written: the proximate processing time, digital objects amount and the last restart point, if needs. job runs and write in database after every operation which successful completed and writes it in a success table. The job is deleted from regular table with jobs to do only if it not contain images. For images, the task is marked for thumbnail generator and remain into "to do jobs" list. if the job finished with failure, the task detaches the job and let the job in a initial stage. So, a further task can try to complete the job. Here is necessary an counter which could count the retry amount, but is not implemented yet. the task itself exit successfully. For implementation details, see also Implementation_details_of_Java-based_Fedora_Ingestion_code/Technical_documentation. For the collections that contains images, a further task instance will try to generate thumbnails if this is necessary. This step makes easier the searching tool job MediaIBIS when is looking in repository. Not all the images have been provided with thumbs, so this task is accomplish by Thumbnail Generator. This tool is looking in Working database for images that have not been provided with thumbnails. If exists, a second thread will be fired and it will generate image's thumbs and makes this available for searching tool. This page was last modified on 19 January 2010, at 12:16.